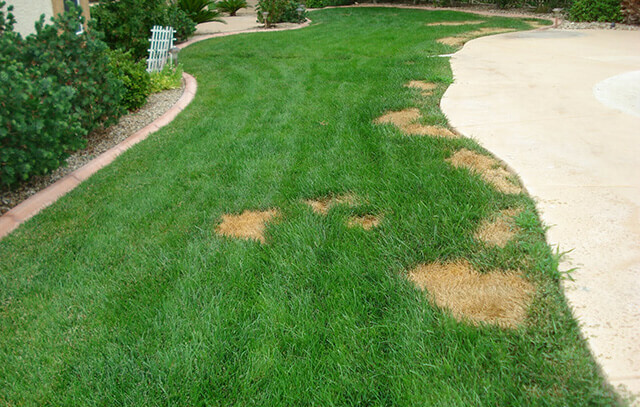 Anyone with a pet dog knows that all the love and attention they provide comes at cost… dog spots on the lawn. They are most apparent after the snow melts each spring but they continue to turn up all summer long. Dog spots are round patches usually 4 to 8 inches in diameter but can appear larger when several spots join together. The center of the spot is yellow dead grass surrounded by a ring of dark green grass. When dogs do what dogs do on your lawn a series of events are put into play. Dog urine contains high concentrations of acids, salts and nitrogen which when put upon the lawn cause it to burn and kill the grass plants. 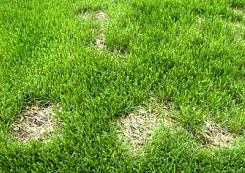 As the lawn is watered it starts to dilute the urine spreading the urine (nitrogen) causing the grass surrounding the spot to turn greener and grow faster… just as if you had fertilized the grass. Once the lawn has been damaged, no amount of watering, fertilizing, hoping or praying will revive your once unblemished lawn. It’s dead and your dog is guilty of the crime. You will need to replant the grass in those spots. Start by raking and removing the dead grass. Next you will need to deal with the contaminated soil. The best solution is to add some lime to the soil and soak it in with water. The lime serves to restore the pH balance of the soil allowing new grass to grow. Now you can add some new soil and seed.